The Shadow Creek Ranch hunting experience is a world class adventure whether you are a first time hunter or a seasoned veteran. Our goal is to provide a safe, captivating and rewarding hunt that you will remember for years to come. I have had an opportunity to hunt elk with Buck and Marty in 2014 and 2015 at the Shadow Creek Ranch. For me, these were hunts of a lifetime and memorable trips. Buck and Marty are professional, knowledgeable, hard working, and personable. The accommodations were first class, the views were spectacular, the hunts were great, and the service provided by the staff was outstanding. I will treasure these experiences for the rest of my life. Thank you for making it so memorable! We hunt big game on the Ranch in Colorado Game Management Unit 37 on over 4,500 acres of pristine private property surrounded by either private ranches or US Forest Service. Located in the heart of some of the best elk and deer hunting in the state, Shadow Creek produces trophy size bull elk and Boone and Crockett-class bucks. We provide guided hunts in all hunting seasons for owners and their guests. Black bear and mountain lion hunts are also available. 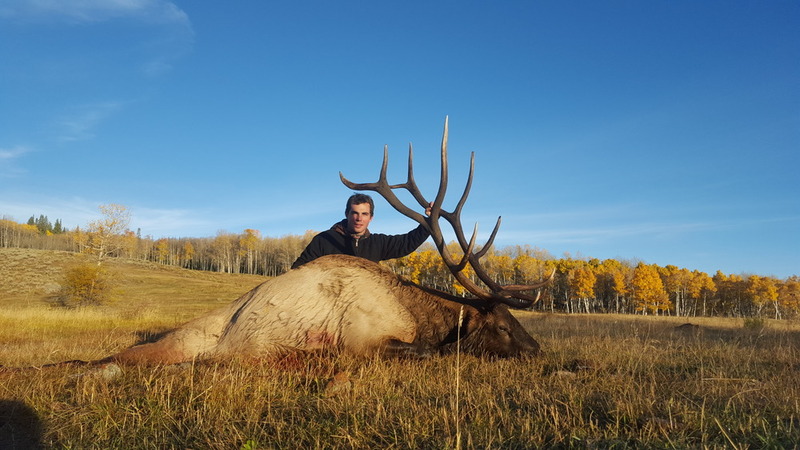 My son and I had the Elk hunt of our lives at Shadow Creek Ranch, guided by Buck McNichols. Buck and his team welcomed us when we arrived and made sure we had everything we needed for both the hunt and lodging. Once settled we were able to ensure our rifles were sighted in at their well established range (including a long range gong target). The day of our hunt Buck discussed the hunt plan and what we could expect. Needless to say, our expectations were soon exceeded. The morning hunt is best described as a 1.5 hour steady run uphill that ended when my son shot a beautiful 6X6. The afternoon hunt was unlike the morning. We slowly stalked through higher ground seeking and listening for signs. Just prior to day’s end, Buck directed us to a faint bugle that ultimately resulted in a respectable 6X6 for myself. In addition to our 2 animals, we observed many other elk, coyote, deer, eagles, and 3 bear!